A blend of love and elegance, the mixture of red,pink and yellow is great for those wishing to express thanks. Often used for thanking those who have helped you, the combination of colors helps ensure a respectful yet neutral ambience. 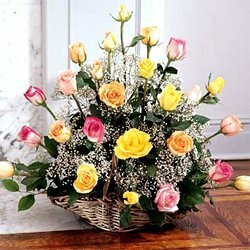 Featuring 2 dozen with assorted greenery, it's a gift welcomed by anyone on your list.